Yesterday, Robin Williams committed suicide, succumbing to a life-long battle with depression. It…hits pretty close to home. While I never knew him in person – though I wish I had – one particularly work of his touched me and has kept me going for years. In Part 3 of my Bump in the Road series, I talked about February 27, 2000. In some ways, I consider it the worst day of my life. It was my biggest suicide attempt that landed me in psychiatric care for two weeks. Almost every year since then, I have a small way of “celebrating” that anniversary: watching What Dreams May Come. It’s one of my favourite movies for obviously very personal reasons. Every time I watch it, I bawl my eyes out throughout the whole movie. It deals heavily with suicide and depression while also involving a journey through the afterlife. In my opinion, it’s one of Williams’ finest pieces of acting, as he brings a slew of emotional gravitas to his character the movie. I want to discuss the movie a little more, but it deals with spoilers, so just a warning. In the movie, Williams plays Dr. Chris Nielson. Much of Chris’ motivations involve his wife, Annie, committing suicide over not only his death, but the death of their kids. Eventually, he journeys into Hell itself in order to find and rescue her. Ironically, he rescues her by giving up, himself, choosing to join Annie in Hell, giving up an afterlife in Heaven because he couldn’t do it without her. Annie’s own personal Hell is a dark, rotting, horrific version of their house in the living world. In the movie, people who committed suicide go to Hell because they’ve thrown off the natural order of things. Part of their punishment is that they’re not even aware that they killed themselves. They live in a personal Hell of negativity and self-loathing. They can’t break away from it, have no motivation to do anything about it, and only wallow in their own self-pity. In many ways, this isn’t entirely unlike Depression. As I, Chris joins Annie in Hell. This actually breaks her spell. Recalling her first mental breakdown and attempted suicide when their kids were killed in a car accident, Chris chooses to join her in the dark madness rather than leave her to fight it herself. Yeah, it’s a little silly that the “power of love” breaks them out of Hell, but it’s still a powerful, moving moment when she suddenly comes to almost exactly when he falls into the same spell and she now fights to break him out. When I get depressed and potentially suicidal, my thoughts often drift to Annie’s own personal Hell. I imagine my own personal Hell and how similar I look like to the dishevelled Annie. I think about how lost and broken she looks and how it mirrors how I feel when I become incredibly depressed. Those visuals, as well as both Williams’ and co-star Annabella Sciorra’s acting, have helped me celebrate another year no matter how tough it’s been. Every time I start to feel depressed, I imagine that setting and it partly helps me not to push myself all the way off the edge. I can’t help but wonder if he’s somewhere similar, now. His own personal Hell, I mean. I want to believe he’s not. I want to believe he’s somewhere bright, warm, and happy, like the personal Heaven, Chris Nielson’s. Maybe he has a Cuba Goodin Jr.-like guide. Maybe he has someone that helps him. Maybe he helps others. I want to believe that. I want to believe he’s somewhere where he doesn’t feel worthless or whatever he felt that drove him to this. It’s more than a little ironic for me that he killed himself and suffered through depression and yet also starred in a movie about that very same thing. He starred in a movie that helped me celebrate and get through some very tough times. I don’t know if I can watch the movie with the same feelings again, but I’m going to try. 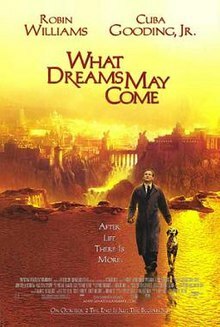 This entry was posted in Depression & Mental Issues, Life Stuff, Movies and tagged Depression, Robin Williams, What Dreams May Come. Bookmark the permalink. Interesting insights in your piece and the parallels highlighted in your discussion not only offer me a new perspective on the film but also hold to support some of the emotions I encountered with it. I felt that the film depicted depression as an embodiment of death, and the decay, and rot reflected this. In my opinion, the fact that life is not possible without death an the blurring and blending of these two together were meant to show some insight into depression to the viewer. Interesting that you saw depression as one’s own personal hell. “A living hell” if you will. It is also ironic, or perhaps not, that someone who made people laugh with such facility should know the dank and darkness of life so well. One can’t help but wonder just how elated and magical it must have been when Robin Williams was at the height of ecstasy with his life. I am reminded of the brilliant colors that reflected this in the film and the grace by which they blended and moved. Keep an eye out for this when you take up the task of watching the film again this year. Even a at this dark moment one can’t help but be reminded of a flurry of manic movements and a sparkle in his eyes before he brought a rush of life up from inside you and countless other humans. In my mind if feel certain that Robin Williams must have really loved life too. I enjoyed reading your discussion and your take on the recent events.